Heathrow is an unincorporated, large suburban community in Seminole County, Florida. It consists of approximately 2,000 homes and the Heathrow International Business Center, an office park. 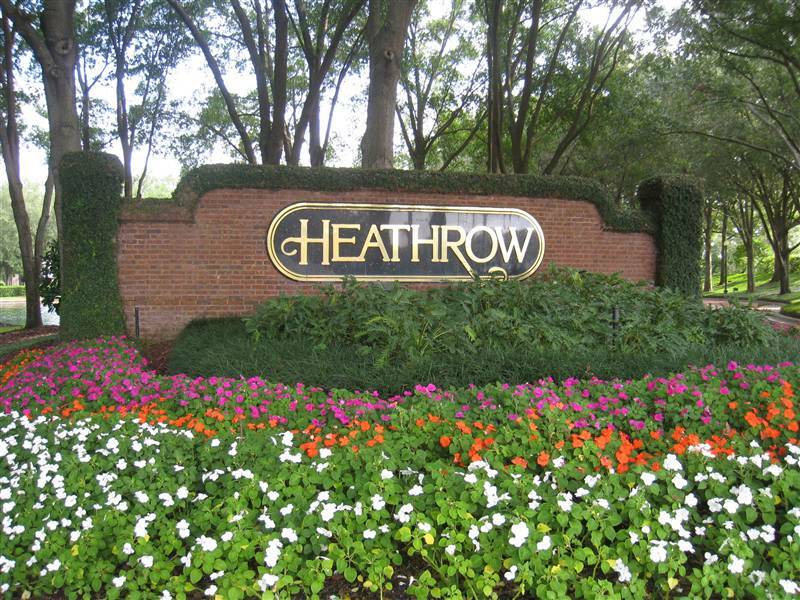 Heathrow represents a burgeoning, up-and-coming private community, technically located in the boundaries of Lake Mary. Its popularity and population has increased significantly in a short period of time, making it one of the most active and desirable markets in Central Florida real estate. Homes for sale in Heathrow earn extraordinary focus. Here, neighborhoods are among the safest in the entire nation. Crime rate is less than 95% of other cities in Florida. At the same time, Heathrow home values are much greater than the Florida and National average. Home values in Heathrow continues to rise, as neighborhood and community amenities keep getting better. Those interested in relocating the community should check on available homes now to get the best value for your dollar. Find out more about homes for sale in Heathrow, its subdivisions and luxury neighborhood amenities. Get details on homes for sale, recreational opportunities, and much more with a unique, map based lifestyle search. Get connected with expert advice and help if you have a question. Contact us at Tolaris Realty. Show-stopping Spanish Mission estate custom-built by Ross Jordan on nearly 2 acres with serene views of Lake Marietta is located in the exclusive gated enclave of 13 homes in Summer Oaks Estates, off Markham Woods Road near Heathrow. Sweeping views of the lake are featured throughout this home, with nearly every single room taking advantage of the dramatic backdrop this nearly 2-acre property offers, with several outdoor living spaces as well! The master suite features soaring ceilings, gorgeous lake views, double-sided fireplace, seating area and an expansive closet area with built-in organizing systems. Your kitchen has it all, with top-of-the-line 6-burner gas range with additional griddle space, built-in refrigerator, wine-cooling refrigerator, and professional Dacor hood; an absolute chef's delight. A tranquil courtyard space right off the eat-in kitchen is ideal for a relaxing evening in quiet serenity. Both family and living room have fully pocketing and hidden 10' sliding glass doors leading out to the expansive wood ceiling lanai, with summer kitchen overlooking the oversized pool and lake! No expense has been spared in this home, with oil-rubbed bronzed hardware throughout, exotic woods, travertine, granite, and mosaic-laid showers; truly must be seen to be appreciated! A whole-house generator ensures no power interruptions. This property may be under audio and visual surveillance. Come discover one of Lake Mary 8217;s most distinguished homes!This CUSTOM DESIGNED and expertly crafted Southern Living estate in a small GATED ENCLAVE of only 12 homes is perfectly poised on 2+ ACRES boasting water views from Lake Marietta, making this beautiful property one that will be genuinely appreciated by Car Collectors, Nature Lovers, Water Enthusiasts & Conversationalists. From conception to completion, every detail was carefully considered including the DETACHED 5 CAR GARAGE, the expansive and inviting FRONT & REAR PORCHES, the RESORT-worthy POOL/SPA, the magnificent landscaping and every inch in between. The indoors is magazine-worthy & offers a variety of gathering spaces, including the Office/ Library, formal and casual Living rooms, a dual-island designer Kitchen with PANORAMIC VIEWS and an upstairs BONUS/MEDIA ROOM. Romance takes on a whole new meaning with evenings spent reminiscing by a fire pit, listening to the owls from the Owner 8217;s Suite balcony or relaxing in the hot tub after your guests reluctantly leave for the night. This MULTI-GENERATIONAL friendly floor plan has a secluded downstairs bed/bath combo in addition to the 4 bedrooms upstairs, as well as more than 1600 SF of UNFINISHED STORAGE SPACE above the detached garage that is begging to be a teen retreat, the college student 8217;s home-away-from-home, or the Ultimate Man Cave! Postmarked right in the middle of Lake Mary Blvd & 46A in the COVETED Markham Woods corridor, this GORGEOUS property is certain to steal your heart 8230;we promise! WOW-nearly 2 acres in Heathrow with a separate private guest house with kitchen and laundry room! Huge price reduction on this private resort-style oasis!! Over 6,700 square feet, this secluded and completely custom estate sits on nearly two acres of meticulously landscaped paradise, centrally located in Heathrow 8217;s premier golf community with 24/7 guarded access. A true one-of-a-kind property, this palatial compound boasts 8 bedrooms, 6 baths. The outdoor living space surrounding the pool and spa is an entertainer's dream come true!! This home is a MUST-SEE!! As you pull into the private, extensive driveway on your way to the over-sized, side-entry three car garage complete with ample storage, you will be welcomed home by breathtaking scenic views. You 8217;ll step into formal dining and living areas adorned with authentic oak. Your 42 8221; hand-crafted wood kitchen cabinetry coupled with stainless steel appliances and custom granite counters will make you're the toast of the neighborhood. Step through the pocket sliding doors and relax alongside the most breathtaking pool/spa and summer kitchen you 8217;ll ever see, including a stone waterfall and Jacuzzi. Your guests will fight to enjoy your lighted basketball court and chipping green. Every room features a stunning view without compromising privacy, while a whole-house generator guarantees that you 8217;ll continue to live in luxury, even in the harshest of weather. Welcome home!This property may be under AUDIO/VISUAL SURVEILLANCE. Pre-Construction. To be built. PRE-CONSTRUCTION - TO BE BUILT. Markham+Orange homes are designed to delight the human spirit by blending classic luxury with modern amenities in an environment that celebrates the best of life both inside and out; located in the highly sought after neighborhood of Heathrow. From the vaulted ceilings to the exquisite imported flooring, meticulous attention to detail is the hallmark. Each spacious bedroom is complemented by floor-to-ceiling windows and oversized closets. Gourmet kitchen includes state of the art appliances and is perfect for cooking an intimate meal for two or hosting a dinner party. On the outside, you 8217;ll be greeted by an expansive rooftop deck that 8217;s perfect for entertaining or simply enjoying a beautiful Florida sunset. Featuring the award-winning architectural design of Randy Bumbalough, our unique homes are built with all the details in mind. Open spaces illuminated by natural lighting, advanced home automation, beautiful landscape, three-car garage, and furnishings cater to the most refined of tastes. All for one purpose: overwhelm the senses. The only thing missing is you. Parcel ID is pending with Seminole County, this is part of lot split. NEW PRICE! HEATHROW WOODS CUSTOM ESTATE LOCATED ON A PRIVATE 1 ACRE LOT! This home was custom designed by the owner w/ with no detail spared! An exquisite grand entrance leading to an open living room w/ framed glass overlooking the 50' pool w/ waterfall & separate stone spa! The floor plan features 4 bedrooms (COULD BE 5), w/ 4 baths, executive office, large bonus room & formal dining room & living room. The gourmet kitchen has stainless steel appliance, custom stone counter tops & solid wood cabinets. Impressive wood framed tray ceilings, travertine flooring in all the main areas & wood floors in all the bedrooms. Expanded lanai w/ plenty of room for entertaining overlooking the private lush yard! Circular brick paved driveway w/ rear side entry garage. Energy efficient features include a radiant barrier on the roof, solar heating for the pool, double pane windows & a multi-zoned a/c system w/ 1 zone per room! This home has it all with over 4700 square feet under air of luxury living! Heathrow Woods is part of the Heathrow Community w/ its own separate 24 hour manned gated entrance. The amenties include WONDERFUL Sawyer Lake Park w/ playground & ball fields, basketball courts, soccer field & a clubhouse. The Country club has an outstanding golf course, tennis courts & pool facilities. Close proximity to I-4, 417, shopping, Colonial Town Park w/ fabulous restaurants! Approx. 35 minutes to the beaches (Daytona & New Smyrna), approx. 45 min. to Disney. This property may be under audio/visual surveillance. Furnished Arthur Rutenberg model home is available with a leaseback to the builder. This beautiful Mediterranean style home with an open floor plan features a chef's delight Kitchen with stainless steel appliances, 5 burner gas cooktop, large island, granite counter tops, wood cabinets with designer door hardware, upgraded glass backsplash, under cabinet lighting and porcelain tile floors. The Master Bath features crown molding, wood vanity cabinets, quartz vanity tops with undermount china bowls, Freestanding bathtub and a 9'x5' walk in shower. This delightful open floor plan offers many, many custom features including Wainscoting detail in Den, Decorative Stained Box Beams at Great Room recessed ceiling, Stacked Ease Stone Great Room wall niche, porcelain tile floors in Foyer, Gallery, Kitchen, Family Dining, Great Room, Utility Room, quartz countertops with undermount china bowls in all baths and crown molding in all living areas. The energy appointments include Open Cell Foam insulation, Injection Foam in block walls, LED lights, Low E insulated glass in all windows and sliding glass doors, gas tankless water heater, 15 Seer high efficiency heat pump. The screened pristine pool with sun shelf, outdoor fireplace, brick paver decking, covered lanai and covered cabana with outdoor kitchen combine to give you a resort retreat. Gorgeous sought after STEEPLE CHASE subdivision in Lake Mary, One of the first built homes, so you get the best lot. Front balconys looks over a beautiful wooded area.4 bedrooms/ 4.5 bathrooms pool home. Master suite has a gorgeous chandelier with a bathroom/soaking tub/separate large shower/stone top double sinks. This home has such a beautiful flow. Exquisite dining area with an 11K crystal chandelier and wood floors. The den with wood flooring has a spiral staircase to the 2nd floor. Move into the large open concept area of kitchen and family room including a kitchen breakfast area. You can cook with your double oven and gas stove top, island with stone counter tops and still be involved with family and friends. Open the sliding glass doors to the covered patio and swim in your beautiful heated blue swimming pool and hot spa with a fenced in yard. Laundry room inside and 3 car garage. Moving upstairs to 3 bedrooms, large media room or (game room) 3 bathrooms. Located in the best school district. Tankless water heater, top of the line gas heat pool system. Beautiful curtains/drapes and gorgeous lighting are included with home. So many more upgrades, make your appointment today to see this magnificent well maintained home. NEW PRICE! HEATHROW CUSTOM WATERFRONT ESTATE! This extraordinary home is like no other set upon one of Heathrow's largest lakes! Large 2-story balcony with iron railing overlooking pool & water. New screen enclosure installed 2017. Imported STONE flooring, impressive gourmet kitchen with granite, sub-zero refrigerator/freezer, sub-zero under-island drawers, custom cabinetry and commercial grade gas appliances. Butler's pantry with imported marble, a built in wet bar and wine refrigerator. The 2 sided fireplace between the living room and master bedroom also has exquisite imported marble from floor to ceiling! Beautiful circular brick paved driveway with an inviting 2 story entry! CUSTOM QUALITY THROUGHOUT! Many amenities included in this 24/7guard-gated golf community! Wonderful Sawyer Lake Park with large playground including ball fields, basketball courts and a boardwalk to lake. Very close proximity to I-4, 417, shopping, Colonial Town Park with fabulous restaurants and miles of walk & bike trails! This property may be under audio/video surveillance.